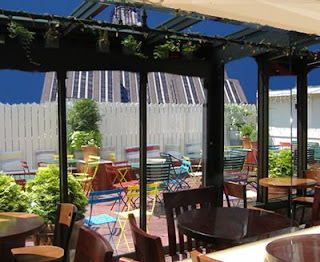 In keeping with the momentum of today and the sweltering weather compared to yesterday's flurries, I have decided to share a rooftop bar I stumbled across while researching for a place for one of my friend's bdays: Me Bar. The place is actually pronounced "May" Bar, with an accent over the "e," the Korean word for mountain, which is represented in its' sky high locale. While I haven't actually been there as of yet, this is one of those places I aspire to visit, especially during the summer when rooftop bars are a hot commodity to come by. Some of the downsides of the bar is that it is said to be open until "at least midnight," which isn't very promising for a late nightcap, and the Shecky's article warns to call ahead since the place is usually closed for private parties, which takes the greatness of a spontaneous stop out of the question. Fret not. The website, with it's humorous speech bubbles very reminiscent of Perez's unsuspecting post-edit comments, will show you the place doesn't take itself too seriously and might be worth checking out amidst its' faults. If you go before me you better let me know what you think!